The Governors Island World War One Memorial Project has been successfully completed and three bronze tablets are back where they belong on the island. 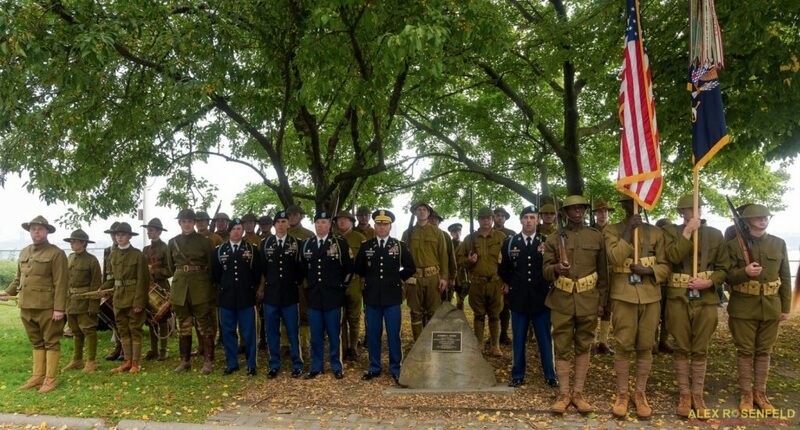 In three heartwarming rededication ceremonies held during Camp Doughboy WWI History Weekend, September 16-17, the memorials were unveiled by the U.S. Army’s storied 1st Battalion, 16th Infantry Regiment, 1st Division. The Iron Rangers traveled from Fort Riley, Kansas, to lead the ceremonies, and were joined by forty WWI reenactors. *General John J. Pershing, commander of the American Expeditionary Forces. Over the years the three went missing or were damaged. The memorial project worked independently to fund the restoration, and I was happy to lead the efforts. To have the Army send ten men to New York was amazing, and it was an incredible honor to host them on Governors Island. The color guard, dressed in reproduction WWI uniforms, was the same color guard that was in Paris in July for the U.S. WWI centennial ceremonies with the French government. Lieutenant Colonel Jon Meredith, the battalion commander of 1st Battalion, 16th Infantry, led the command team. LTC Meredith delivered remarks on both days and truly was a fine leader to represent the famous Big Red One, and a regiment that had been stationed at Fort Jay from 1922 to 1942. It was the 16th Infantry that named the Governors Island roads, fields, and docks in 1928 for their fallen comrades of the Great War. After the opening ceremonies, a parade was held that began on the Parade Ground and marched to the first memorial. The color guard from Fort Riley led the procession, followed by the active duty soldiers and reenactors. The living history reenactors came from the Long Island Living History Association, the East Coast Doughboys, and the New Jersey Field Music Group. The first memorial in the project to be rededicated was to General Pershing. In 1960, for the centennial of his birth, an oak tree was planted and a bronze plaque was unveiled. It stands in front of Pershing Hall, overlooking Manhattan. While the tree has done exceptionally well, the plaque was lost or stolen, so a new one was expertly replicated and rededicated. Dr. Libby O’Connell, commissioner on the U.S. World War I Centennial Commission, delivered the opening remarks, saying that General Pershing’s commitment to America can never be forgotten. LTC Meredith stepped up and said that he’s seen many memorials to General Pershing, but in his estimation this is the most fitting. Following the remarks, the second memorial, just a few hundred yards away, was rededicated. It’s on Kimmell Road, and honors Captain Harry L. Kimmell, a U.S. Naval Academy midshipmen who left Annapolis and joined the Army. He went to France with the 16th Infantry and was awarded the Distinguished Service Cross, twice. Captain Kimmell died while leading Company C in combat. In a fitting tribute, remarks were given by an active duty soldier from the New York City area, Major Jared Nichols, the Battalion Executive Officer of 1st Battalion, 16th Infantry. Major Nichols wore a replica WWI uniform similar to what Captain Kimmell would have been attired in. Two soldiers with the same rank unveiled Captain Kimmell’s new plaque: Captain Mark Gaudet, Bravo Company Commander, and Captain Jon Swanson, Assistant Operations Officer. The groups gathered the following day for a second day of ceremonies, one that saw a sleepy Sunday morning on Governors Island transformed into a grand parade. With the same participants as the day before, joined by civilians, the public, and Gen. Pershing reenactor David Shuey from Virginia on his horse, Aura Lea. The parade began by Castle Williams and proceeded past tree-lined Regimental Row to rededicate the bronze memorial to Private Merle David Hay, killed Nov. 3, 1917. 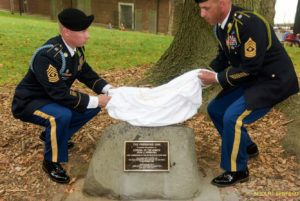 The ceremony concluded with the rededication of Private Hay’s plaque and the unveiling by two enlisted men from his former unit, Sergeant Major Wirth, Operations Sergeant Major of the Iron Rangers; and Master Sergeant McInroy, former First Sergeant of Headquarters Company. The parade then took a trip from Hay Road and through the archway of Liggett Hall onto Division Road. This roadway is named for 1st Division, and the parade proceeded to pass by the memorial on it to Corporal Gresham. After the youngest members of the New Jersey Field Music Group beautifully rendered “Taps”, the parade continued back to the Parade Ground. The three memorials were restored and installed by Peaceable Kingdom Memorials. The team of Beth Woolley, Peter Woolley, and Richard Ardolino did a magnificent job. The company has worked on numerous memorials and monuments on the Jersey Shore, many for veterans, so their work is appreciated on Governors Island. I want to thank the National Park Service, the Trust For Governors Island, the men of the Iron Rangers, the WWI Centennial Committee for New York City, United War Veterans Council, and all of the reenactors (who braved the heat in wool uniforms). When I started this project a few years ago, I was not ever imagining that the installation and rededication ceremonies would ever be so grand and touching to take part in.